You can earn your high school diploma from home. It's your next step to getting ahead. When you become a high school graduate, you will have new opportunities. Opportunities to earn more money, qualify for a new career, and continue your education by going to college or technical school. 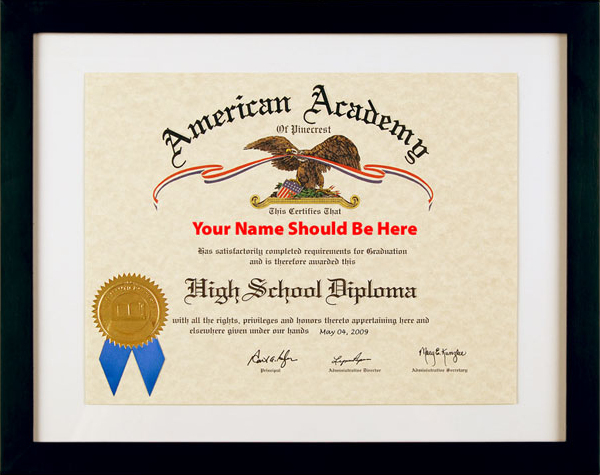 Whether you are home schooled, dropped out of traditional high school or never attended high school, American Academy of Pinecrest can help you graduate with a diploma from home. Earning your high school diploma with American Academy of Pinecrest is CONVENIENT, ACCREDITED, and AFFORDABLE. Now you can earn your high school diploma in as little as 6 weeks! With the high school diploma correspondence program, everything you need to earn your diploma is mailed directly to your home. All study materials have easy-to-read print. And each subject has only one exam. Exams are open book, multiple-choice and you may retake any exam until you achieve a passing score. There is a one time fee of $25.00 to retake an exam. Find out how you can graduate with an accredited high school diploma from home. Call toll-free 1-800-470-4723 to speak with a friendly Academic Advisor. We will gladly answer any questions. Or enroll now and we will send out your receipt of payment, experience profile, and study materials so that you can start earning your high school diploma right away. Please allow up to 7 business days for delivery.